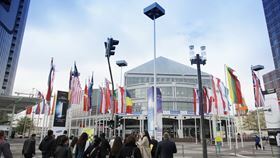 ISH 2019 will take place from 11 – 15 March with France as its Partner Country. Image: Messe Frankfurt. The organisers of ISH 2019, the biennial trade fair for HVAC and water, have announced that France will be the third ISH Partner Country, following Poland in 2015 and Turkey in 2017. ISH 2019 will take place from 11 – 15 March in Frankfurt. Every two years, ISH offers key international players from the sector a platform for spotlighting challenges and presenting technical solutions. Additionally, the public focus in each event season is on a different market setting. In 2017, 54 exhibitors and 4,668 trade visitors from the ‘grande nation’ took advantage of this potential, making France the third biggest ISH visitor nation. France and Germany have close links and strong economic ties, as shown by German exports to France worth €105 billion and French exports to Germany worth €64 billion. At ISH 2017, 2,485 manufacturers from 64 countries presented their products and services on 261,300 square metres of exhibition space to an audience of 198,810 trade visitors. Technical abstracts for RISE 2019 should be submitted by 18 March.